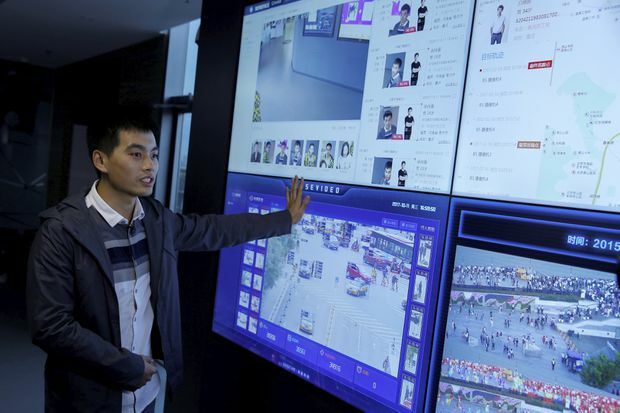 SenseTime surveillance software identifies details about people and vehicles during a demonstration at the company's office in Beijing, China, in October, 2017. When it comes to attractiveness, I fall short of perfection by only the narrowest of margins. On a scale of 100, I am a 99. And on one recent day, I looked better than 100 per cent of others inquiring about their looks. I have evidence: An artificial intelligence system developed by a Chinese company that is one of the world’s top computer vision firms scanned my face and rated me. You can dispute this, and you probably should. The computer in question is located on the fifth-floor offices of artificial intelligence company SenseTime Group Ltd. and, since it is being used to sell the technology powering the attractiveness ratings, I presume it has not been discouraged from giving positive feedback. Indeed, it told me at one point that I am 11 years younger than my passport would suggest. It failed to deduct points for my generally dishevelled state or for the obvious reason that if I actually merited such a rating, I probably wouldn’t have made a career out of hiding behind a pen. 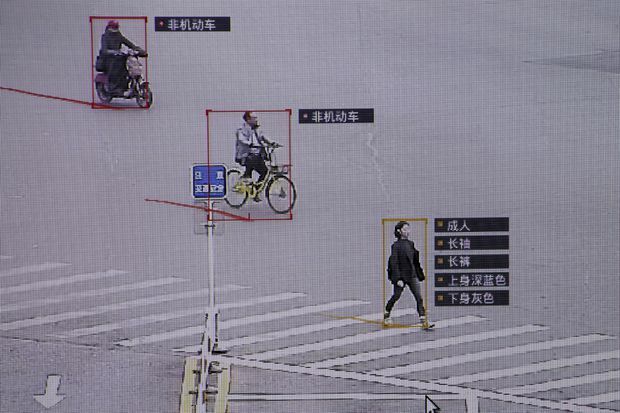 It’s a decidedly sunny introduction to the rapidly expanding world of facial recognition in China, where companies and police alike are furiously pursuing new ways to profit from the pervasive installation of computer vision. The attractiveness test is a high-tech carny, one that can put a smile on a customer’s face. But the underlying technology can also make that face into a pass-card to all sorts of conveniences, as well as a red flag to police. SenseTime Co-Founder Xu Chiheng talks about the surveillance technology of his company in October, 2017. Backed by companies such as Alibaba Group Holding Ltd. and Qualcomm Inc., four-year-old SenseTime has quickly become one of the world’s top AI startups, with a valuation surpassing US$4.5-billion, according to Bloomberg. It is deliberately headquartered in the Tsinghua University Science Park as a way of bringing itself close to the country’s top young talent. I came here one recent morning for a tour in hopes of learning more. 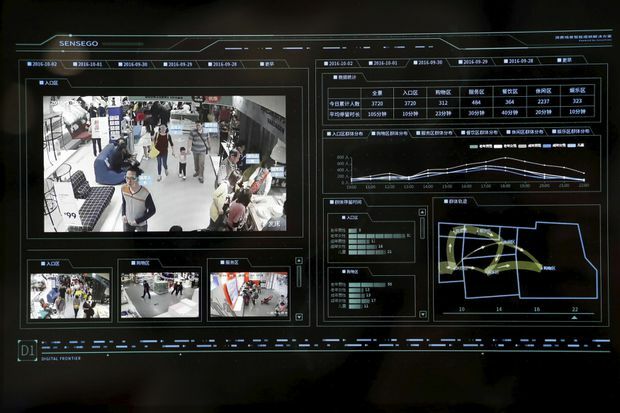 Chinese companies have, in the span of a few years, attained some of the world’s most impressive facial recognition capabilities, in some cases beating out western firms at competitions organized under the U.S. Office of the Director of National Intelligence. China, too, has become a world leader in the deployment of such technology, which is being used – often in small trials, but with a view to much broader use – to dispense toilet paper, lend books, shame jaywalkers, fine drivers, spot criminals, monitor student emotions and find lost elderly people and children. The technology has been of particular interest to Chinese authorities, who have begun to use it as a pillar in the construction of a new kind of digital authoritarianism, one where the tools of the state are powerful enough to track, in minute detail, the movements and utterances of its people. The office tour at SenseTime, in other words, isn’t merely a window into the future. It’s an exhibition of the present. The company’s technology has been installed in Chinese airports, railway stations and telecom companies to verify identities, and is being used by local retailers to power self-service shopping. At the SenseTime office, one camera-equipped television displays ads catered to the basic demographic information of a passerby – Nikon cameras and Daniel Wellington watches for me. “It pushed a watch advertisement to you because it sensed you are a 20-something man, and men always love watches,” Mr. Tan says. If nothing else, SenseTime seems to understand that, when it comes to making customers happy, there are few downsides in dramatically underestimating age. Then he walks to another demo standing unassumingly on a side wall, where a television shows soundless footage of an intersection. As a woman walks by, a small text box instantly appears beside her, showing that she is an adult female wearing a long blue-sleeved shirt and grey pants. The software reports that an adult male is wearing a short-sleeved grey top and grey pants. Passing cars are also labelled: One is a sedan, another a mini-bus. Each car’s colour is automatically extracted, and the software attempts to identify their licence plates and models: a green Hyundai Elantra, a black Audi A6L. At any moment, more than a dozen objects on screen are accompanied by boxes that digitally document their distinguishing attributes. It makes for an impressive demo. But this is not, it turns out, a prerecorded proof-of-concept. “This is a live camera. It sends back a real-time image of the intersection outside the window,” Mr. Tan says. I peek out the window to double-check. Sure enough, the taxi making a left turn outside is the same one on screen. Mr. Tan is apologetic that the system is failing to pick out the licence plates of some cars. The air is milky with pollution, and the camera is located hundreds of metres from the intersection. “If the weather is good enough and there’s no smog, the details of every car’s plate will be entirely accessible,” he says. It’s not hard to conjure the surveillance power of installing such technology on every corner, tracking block by block the movement of just about everything on the city’s streets. Nor is such a scenario a distant one. One of SenseTime’s central innovations is that it has dramatically shrunk this technology. The heavy lifting of image recognition once required a server farm. Now SenseTime can do that work on a tiny computer the size of a small chip. SenseTime surveillance software identifies customers' movement patterns at a department store. Human rights activists have already reported being stopped in their travels by police who spotted them using facial recognition. Identification of individuals requires higher-resolution cameras and more processing power than what now typically exists on city streets. But at SenseTime, the hope is that its image-recognition capabilities will soon spread across the country. Its 1,500-person staff includes 150 people with doctoral degrees working toward that goal. Already, the technology can calculate the number of people in a given space, which police can use to disperse crowds.